Even though Brother DZ1500F is a wonderful machine for heavy fabrics, people are more interested in another Brother machine with the same features and lesser price. This is a straight stitch only sewing machine. It is one among the 6 Designio sewing machines rolled out by Brother. 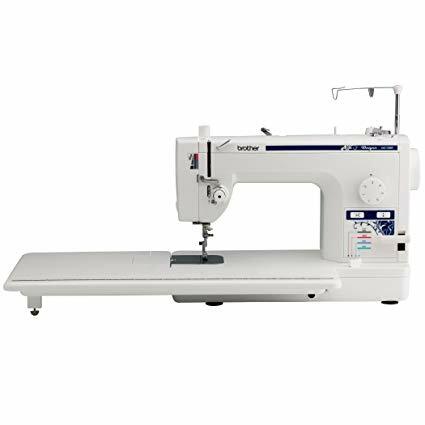 DZ1500F is the second least expensive straight stitch sewing machine in the market. The first being Brother PQ1500S, we will talk about it later in this review. DZ1500F is a machine designed for professionals who do a lot of garment construction and quilting. It is not a high end industrial sewing machine, you can call it semi-industrial. But still, this machine is able to perform as good as those high end industrial machines, thanks to the motor that delivers 1500 stitches/min. It is fast, really fast. It is a heavy duty machine and it is heavy, weighing at 24.2 pounds. The pin feed system on Brother DZ1500F ensures smooth fabric feeding. It comes with a knee lifter which means you can control the presser foot with your knee. Automatic needle threader and thread cutter are great convenience, especially for beginners. Feed dogs can be adjusted in 4 levels which are color-coded for maximum fabric control and smooth feeding. The extension table has a bobbin case opening, which is really handy as you don’t need to remove the table to replace the bobbin. There is a fabric separator tool which can sew seams in contrasting fabrics without puckering. There is a dual thread stand as well. The total bed space on Brother DZ1500F comes to 11 x 23.2 inches with table. One of the highlights of this machine is the needle felting attachment package, which according to Brother is more than $150 value (Really, Brother?). The feet that comes included are General purpose foot, Rolled hem foot, Adjustable zipper foot, Invisible zipper foot, 1/4″ foot, Spring action quiliting foot and Walking foot. The machine has 25 year limited warranty. One thing I am sure about Brother DZ1500F is that, you will never complain about its performance. I don’t have any words to explain how good this machine is on heavy materials. It sews through multiple layers of tough fabrics as easy as a knife slicing through butter. It is equally good with light weight fabrics as well. The large bed area is really handy for large quilting projects. There is a better machine available with same features but lesser price. If you do a lot of straight stitching, Brother DZ1500F is definitely the machine to consider. But there is something you need to know. There is another machine from Brother which has the same features as this machine and costs less (the price difference may change from time to time). It is the Brother PQ1500S. Both machines are exactly the same, except that DZ1500F comes with a Designio branding and needle felting attachment package. If you are not really interested in what the needle felting attachment does, you will be better of going with Brother PQ1500S . There is an interesting statistics regarding these two machines. Only 1 DZ1500F is sold by the time 35 PQ1500S’s are sold. So it is very clear that people are not really interested in the needle felting attachment, which Brother says is worth $150. I also recommend Brother PQ1500S (Read Full Review) as it is less expensive.